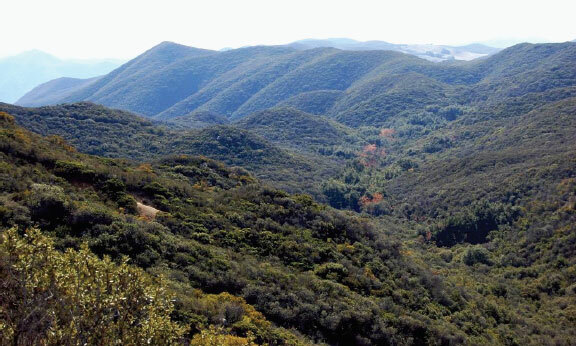 The headwaters lie within the federally-protected San Mateo Canyon Wilderness Area and consist mostly of the steep, chaparral-covered Santa Ana Mountains (rising to a peak elevation of 3,756 feet) and the Santa Margarita Mountains, both of which contain numerous intermittent streams. The two main tributaries in the Wilderness Area are Tenaja Creek and Devil Canyon Creek. The dominate plant community is Mixed Chaparral Scrub, with its distinct and colorful Manzanita species, the articulated branching of the Live Oak (Quercus) trees and shrubs, Toyon, Foothill Ash, California Coffeeberry, and species common to Coastal Scrub communities, such as Coyote Bush and California Sagebrush. 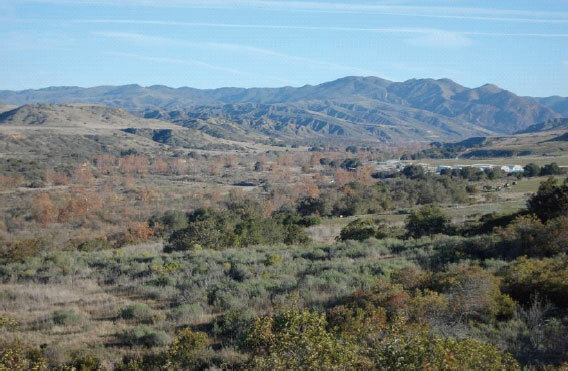 The middle reach of the Creek lies within Rancho Mission Viejo and the Camp Pendleton Marine Corps Base. Because of the private/public ownership, there has been little development within the alluvial plains. The largest tributary of SMC is Christianitos Creek. The confluence is located 3 miles northeast of the San Mateo Creek outlet, near the residence of the largest Marine Corps development within the San Mateo Valley. The confluence was also the site of Panhe, a significant village of the Juaneno culture, with an estimated historic population of three hundred. The village is believed to be over 8,000 years old. 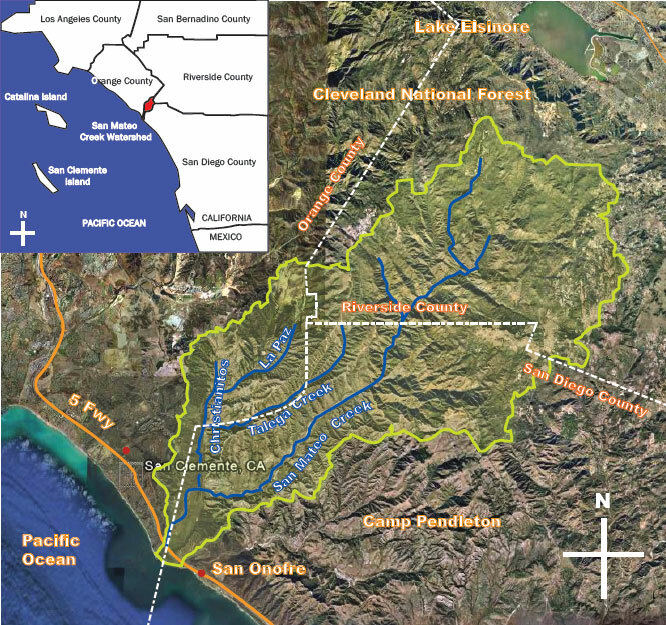 Two of Christianitos Creek's tributaries, Talega Creek and La Paz Creek, are also uniquely untouched as they lay within Rancho Mission Viejo and Camp Pendleton. Chrisitianitos Creek and Talega Creek are known to have the largest population of the endangered Arroyo Toad and provide habitat for other listed species, including the Least Bell's Vireo, California Gnatcatcher, Southwestern Willow Flycatcher and Pacific Pocket Mouse. 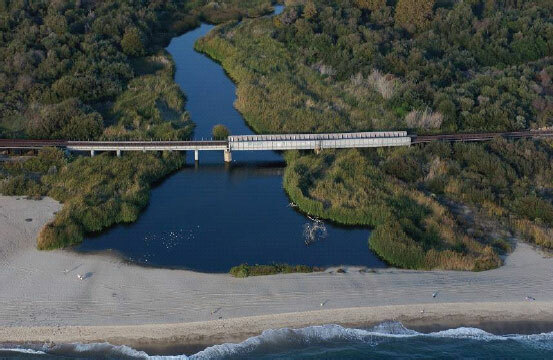 Trestles Natural Wetlands Preserve lies between the mouth of the creek and the 5 Freeway and is wholly within the boundaries of San Onofre State Park. The 160 acre Preserve includes a freshwater lagoon, marshlands and several distinct plant communities including Coastal Sage Scrub, Willow Woodland, Sycamore/Cottonwood and Marsh Wetland. These plant communities are populated with over 219 plant species and provide one of the most diverse habitats in coastal Southern California. The walk from the Trestles parking lot to the beach and lagoon provides a unique and esthetic transition from a highly developed urban area to a relatively natural wetlands and beach. The Preserve fronts the world-renown Lower and Upper Trestles surf break. As such, it has a very large public exposure, with an estimated 300,000 annual visitors.